As a frontier technology, the Internet of Things (IoT) has many people excited. Technological advancements are increasing at an accelerated pace. From tablet-style smart refrigerators to devices that answer all your day-to-day questions as if it was your roommate or even your partner. More and more people continue to search for devices that make their lives easier by saving time and effort, SMART-tech is hot. According to this data, the IoT industry is estimated to grow from $157 billion dollars in 2016 to $457 billion dollars in 2020 attaining a Compounded Annual Growth Rate (CAGR) of 28.5% each year. Large corporations, like Samsung, Vodafone and DHL have already delved into IoT with research and development (R&D) and the subsequent launch of smart products. As large businesses with centralized authorities continue to grow bigger and bigger, the smaller ones are often phased out of the market. The time is now to embrace decentralization. Empowering autonomous organizations that thrive on a network of community members to jointly run the organization in a future-proof way is where we are heading in my opinion. One of the projects that is creating a decentralized infrastructure for the Internet of Things is IoTeX. In this article I would like to address IoTeX, it’s use cases, benefits and potential challenges. First, let’s dive in with a short history lesson on IoT. How did it all get started? The Internet of Things, IoT for short, is a term that is used to refer to machines or devices that can communicate with each other or with human beings. In 1966, German computer scientist and pioneer in the field, Karl W. Steinbuch already predicted: ‘In a few decades time, computers will be interwoven into almost every industrial product’. Three decades later, the term Internet of Things was introduced by Kevin Ashton. He created the term to refer to a system that connects the internet with the physical world through the use of ubiquitous sensors. The term was introduced shortly before the technology company LG announced their internet connected refrigerator. The smart fridge was first in line of an entire array of different smart household devices like the smart oven, smart dishwasher, smart washing machine and smart printers. Between 2008 and 2009 IoT reached mainstream adoption as it was the first time that the number of internet connections with things or devices outpaced the number of internet connections with humans. Karl’s prediction is quickly becoming a reality with the accelerating pace in which technological advancements are being made. IoT has evolved into the backbone of the connected world. IoTeX is one of the projects with a focus on the Internet of Things. 1. The implementation of sidechain technology to run parallel to the main blockchain in order to achieve high scalability. 2. The truly private blockchain, based on reliable payment code, constant size ring signature and one of the first implementations of bulletproof. 3. Creating high-throughput with instant finality and reduced transaction costs with the Randomized Delegates Proof of Stake (Roll-DPoS) consensus mechanism. 4. Lightweight IoTeX system architecture specifically designed for the variety of IoT industries. IoTeX sidechains (subchains) run in parallel with its mainchain (rootchain). The scalability allows for large enterprise-based decentralized application to be run on the IoTeX blockchain. Testnet results already shown a minimum reach of 1000 transactions per second (tps). IoTeX will implement the Roll-DPoS consensus mechanism to achieve high-scalability and security. Cross-chain communication between different subchains will be enabled to support interoperability. Smart contracts will be run on the subchain. Privacy will be guaranteed through lightweight privacy-preserving techniques. IoTeX is not only suitable for IoT dApps, its highly-scalable nature allows it to be applied to the p2p sharing economy, decentralized lending applications, supply chain solutions and user authentication. Commercial size decentralized applications are highly suitable to be deployed on the IoTeX network, because of its scalable nature. – Sub-chain provisioning: enables support for two independent blockchains, running on separate databases in the IoTeX network. 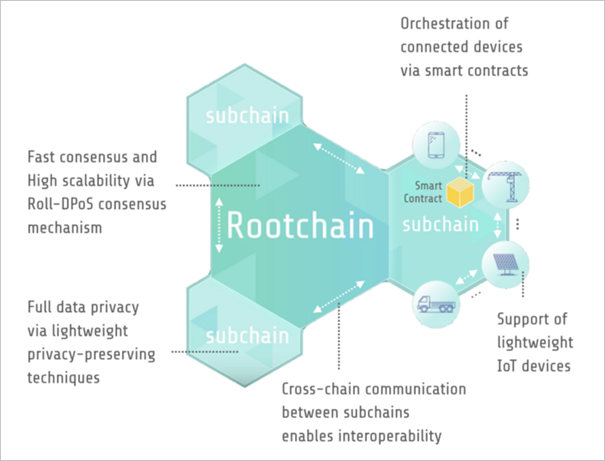 Root-chain is the main chain, while the other chain is the sub-chain. – Cross-chain communication: the ability to transfer value from the root-chain to the sub-chain, with IoTeX wallet support across both participating chains. – Roll DPoS consensus, a proprietary consensus mechanism improving on delegated proof of stake (DPoS) with the support of sub-chain architectures and the ability to process large scale IoT dApps. Roll DPoS is also a more democratic approach to consensus as it is picking a new set of delegates each epoch. In this blog post, you can read all about IoTeX Delegates Program- application, voting and rewards. IoTeX isn’t the only project aiming to disrupt the IoT industry. Competitors include IOTA and NANO. IOTA is a next-generation permissionless distributed ledger technology for a new economy. IOTA is building the first open-source distributed ledger to power the IoT industry with feeless microtransactions and data integrity for machines. IOTA’s proprietary protocol is called Tangle and their cryptocurrency is MIOTA. In the past, IOTA suffered from some security vulnerabilities, but it still managed to be a top cryptocurrency in terms of market capitalization. NANO, previously known as RaiBlocks, is using its own proprietary technology called block lattice. Block lattice is later adopted by another high-performance decentralized ecosystem called Vite. NANO proposes an instant send, zero transaction fee, infinite scalable digital currency. NANO has been under some intense scrutiny after an Italian digital asset exchange BitGrail, got hacked at the beginning of 2018 and became the victim of the theft of an estimated $ 150 — $ 190 million worth of NANO tokens. Since than NANO has seen a price decrease of 97.62% since its all-time-high price back in January of 2018. In IoT projects that are based on blockchain-like data structures, security tends to be the biggest issue. With previous vulnerabilities causing negative press and a decrease in market share, IOTA and NANO have been under some scrutiny from the cryptocurrency industry for not being fully compliant with safety measures. IoTeX believes that through tokenization the network can run in a decentralized manner. Users are being rewarded to participate in the community. On the 15th of February of this year, IoTeX concluded their private sale in which they raised the equivalent of 15,000,000 dollars in exchange for 24% of their tokens. The price of one IOTX in the presale was $0.007. The current price according to data provided by coinmarketcap is $0.0068. IoTeX launched their own ERC20 token that goes by the ticker IOTX. After their mainnet launch in the first quarter of 2019 they will swap the ERC20 IOTX for their own native IOTX tokens. IOTX can be purchased and traded on digital asset exchanges like Binance, Bittrex, BGOGO, Kucoin, Gate.io and IDEX. In the Iotex Telegram channel, I found an overview of the token distribution schedule. Which is very transparent in my opinion. As you can see in the graph below, 10% of the tokens will be released this month in preparation of the mainnet launch. According to the team, a lot of those released tokens will be used for staking when the mainnet releases. If this is, in fact, the case, time will have to tell. As you can see on Coinmarketcap when checking to historical data for Iotx, you notice an increase in marketcap from $ 10 million to $ 17 million, starting February 1st. This has to do with the increase in token supply. Another 10% of IOTX will be released in two months and another 4%, three months after that. 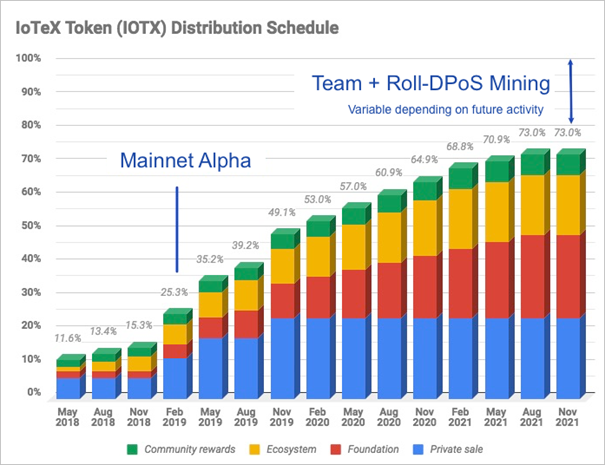 If you plan on investing in IOTX, or if you already have, the increase in token supply is something to take into consideration. During this past year, the cryptocurrency market has been visited by a lot of bears trying to bring down the total market capitalization. They are still having the upper hand, but with the steep decline we seen recently the end of the bear market might be near and we could be entering a months-long consolidation period. IoTeX also suffered from this bearish market sentiment, tokens are currently priced slightly below the ICO token price. With the release of the main net preview ‘Photon’ IoTeX is on schedule to release its official alpha main net in Q1 2019. The increase in token supply is also something to consider as a potential challenge. It is unclear at this point how many users will actually try to stake their IOTX tokens. This is something that will become more clear after the mainnet launch. 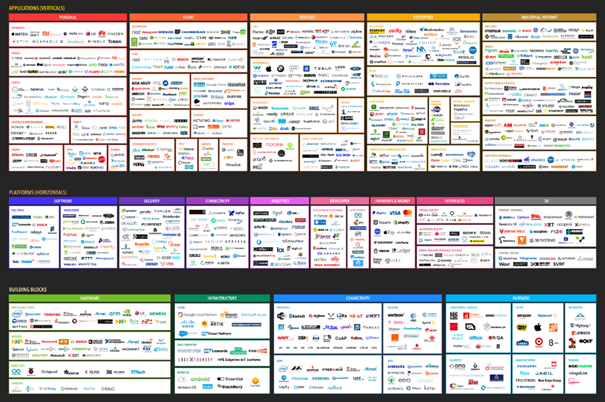 As shown in the image about the IoT landscape platforms, the IoT industry has seen tremendous growth. As I see it, IoT is hot. Startups in the IoT industry keep popping up with new smart devices that simplify human life. Camera-enabled doorbells that allow you to connect with visitors through your smartphone or tablet, opening and closing your curtains with one press on a button, adjusting the room temperature with an app on your device or checking in on a loved-ones tracking device that they ware for cases of emergency. People are constantly looking for ways to communicate smarter and more efficient. Applying connectivity to devices will make it easier but also more vulnerable to hacks. In-home wireless devices like WIFI-printers are more susceptible to hacks. Especially camera- or microphone-based devices can do a lot of harm when they are hacked. This issue needs to be addressed in order for the entire industry to move forward. IoTeX was introduced into the market in May 2017. The project did not launch an ICO, because they had enough interest from professional investors interest. They were fully funded by high profile investors like Neo Global Capital, BlockVC, #HASHED, Draper Dragon and Kinetic Capital. A few concerns I have are the long term project viability, because of the current lack of a revenue stream and ongoing cryptocurrency bear market. The low initial circulating supply can become an issue now or in the near future as there will be an influx of released tokens flooding the market. In May 2018 the initial 11.5% of IOTX tokens were released with only a few percent of tokens being released since. On the 1st of February, the circulating supply increased by 70%. In two months-time another 10% of the original total supply will be released on the market. As I see it, IoTeX is well on their way in creating a privacy-focused, scalable blockchain solution with a focus on a market (IoT) that has a lot of upwards potential. However, the low initial supply, an accelerating increase in token release in the coming months, with the added overall bearish market conditions make me not want to invest in the project at this time. Disclaimer: I would like to state that I am not being rewarded or incentivized to write this project overview of Iotex. This article is not intended as investment advice. You should always do your own research. All the information provided in this article is based on my own personal opinion. During these challenging market conditions, I strongly urge everyone to thoroughly research projects to potentially invest in. If you do decide you want to invest, only invest money you can afford to lose. If you like my content about blockchain and cryptocurrencies, you can give me a follow. I also have an account on Twitter. You are welcome to follow me there as well. Check my BlockDelta profile for additional info and articles. I hope you have enjoyed this article, and please comment in the allocated section below if you have any further questions.